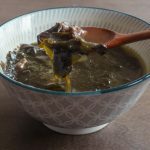 Deliciously light and nutritious seaweed soup that is a staple to Korean homes and particularly enjoyed on birthdays! The second to last day of March is DrJuh’s birthday so guess what I made? Miyeok guk! His family actually doesn’t follow this Korean tradition but my mom (being a bit more old school) has made it every single birthday! Even when my brother can’t make it home because he’s living in San Francisco, she still makes a small pot of miyeok guk and buys a little cake to enjoy with my dad. 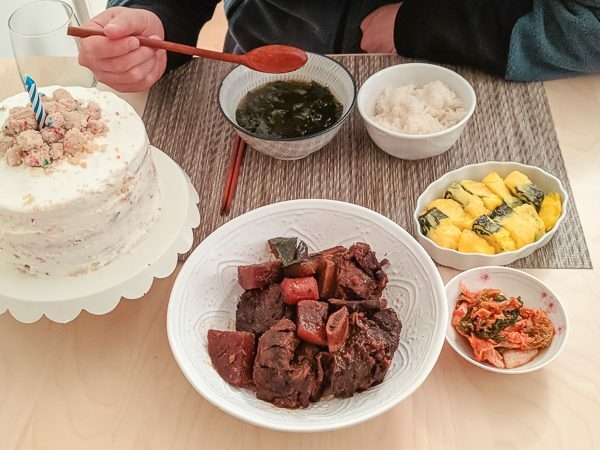 I like carrying on some of these little Korean traditions in our small Korean-American family of two so I went about making it (along with a table of galbi jjim and homemade cake!). 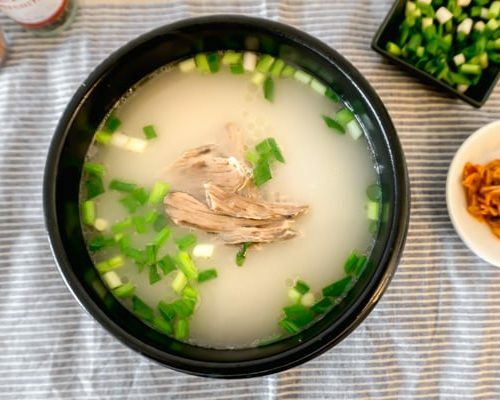 In Korea, miyeok guk is also traditionally consumed by woman who recently gave birth because of the health benefits that help for a faster road to recovery and to producing healthy breast milk. 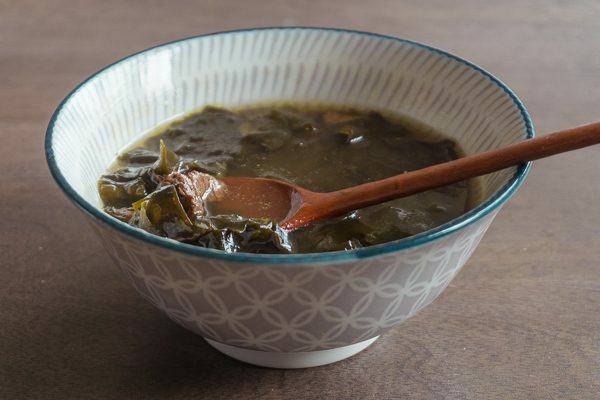 Often, pots of seaweed soup are made for the new moms and then for every birthday on out for the baby! Miyeok guk most often has a base of beef or mussel but can also have oysters, or other seafoods as the base. I used to like the beef based one the most as a kid but have grown to enjoy the mussel one a lot! Though, DrJuh’s favorite is still the beef and it was his birthday! 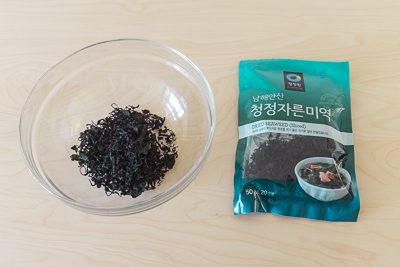 Dry miyeok is usually sold next to the gim (Korean roasted seaweed) section in Asian grocery stories. It’s very common so most stores with Asian ingredients should carry it! 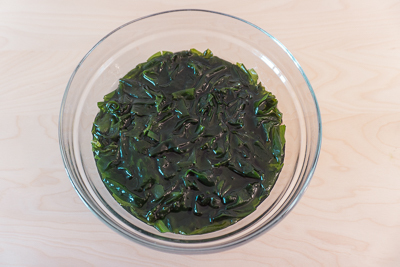 You’ll need to soak the dry seaweed for at least 30 minutes (preferably about an hour) before beginning to cook. 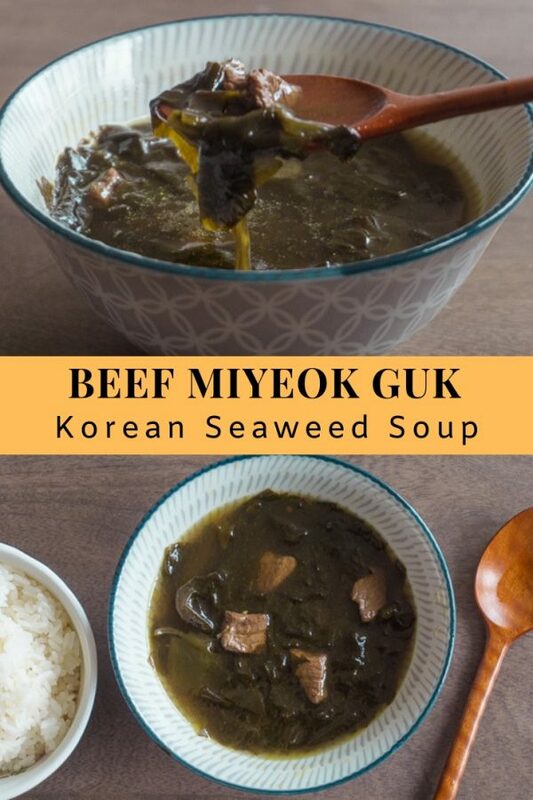 Miyeok (Korean seaweed) can have a slightly slippery texture and to someone who has not grown up on it, it may seem a bit odd, but give it a try! 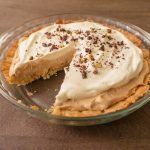 It’s super nutritious and easy to make. 1. 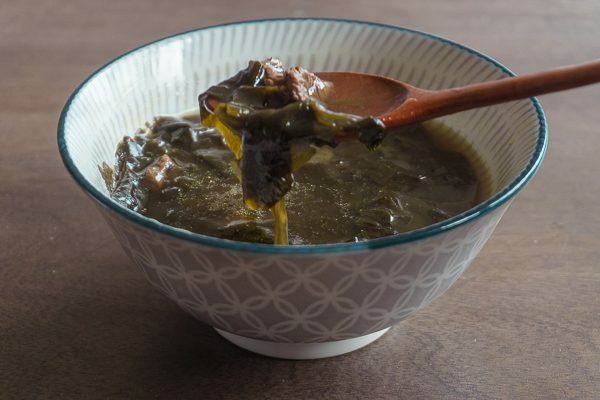 Soak the miyeok in a large bowl filled with water for at least 30 minutes, preferably an hour or more. Once soaked, rinse the miyeok under running water a few times. Squeeze/drain the water from the miyeok. Set aside. 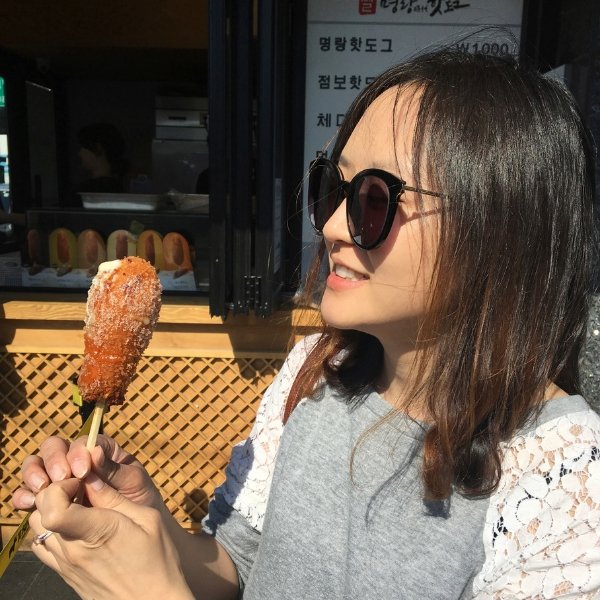 *If using large sheets, cut the miyeok into bite size pieces. 2. 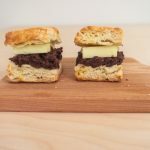 Cut the beef into bite sized pieces. Gently tap with a paper towel the redness from the meat. Sprinkle a bit of black pepper. 3. In a medium sized pot, drizzle in the 1 Tbsp of sesame oil and heat on medium heat. Once the pot is warm, add in the beef. 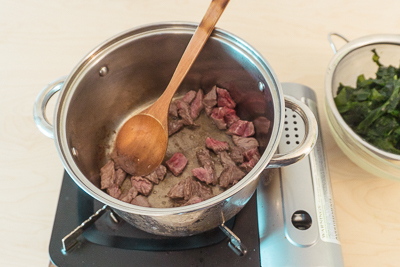 Saute the beef until no longer pink but not fully cooked through. Add the miyeok into the pot and continue to saute for at least 5 minutes. *If not in a hurry, sometimes I saute here for 8 or more minutes to really deepen the flavour (make sure the miyeok is not sticking to the pan). 4. Add in the water and bring to a boil. Skim off any floating residue. Add in the rest of the soup soy sauce and minced garlic. On medium heat, simmer for about 20 to 30 more minutes. Sprinkle additional salt to taste. *If you’re pressed for time, 20 minutes is fine! The longer you simmer, the deeper the flavour will get. 5. 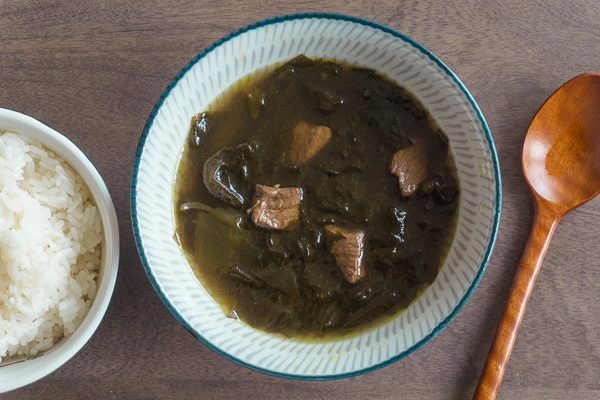 Pour a serving with some seaweed and beef pieces into a large soup bowl. 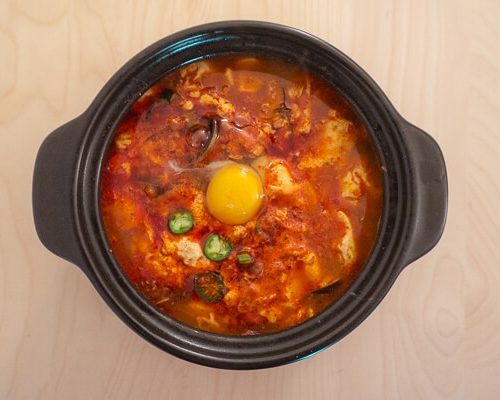 Serve with a warm bowl of rice and kimchi! Take a spoonful of rice and dip it into the bowl of soup! birthday meal at home before heading out to a date night! 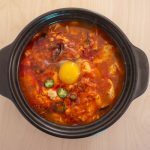 Deliciously light and nutritious seafood soup that is a staple to Korean homes and particularly enjoyed on birthdays! 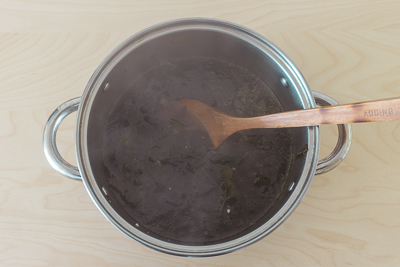 Soak the miyeok in a large bowl filled with water for at least 30 minutes, preferably an hour or more. Once soaked, rinse the miyeok under running water a few times. Squeeze/drain the water from the miyeok. Set aside. 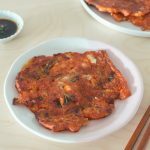 *If using large sheets, cut the miyeok into bite size pieces. Cut the beef into bite sized pieces. Gently tap with a paper towel the redness from the meat. Sprinkle a bit of black pepper. In a medium sized pot, drizzle in the 1 Tbsp of sesame oil and heat on medium heat. Once the pot is warm, add in the beef. 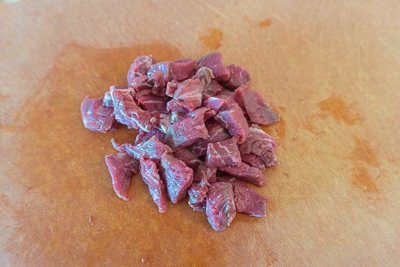 Saute the beef until no longer pink but not fully cooked through. Add the miyeok into the pot and continue to saute for at least 5 minutes. *If not in a hurry, sometimes I saute here for 8 or more minutes to really deepen the flavour (make sure the miyeok is not sticking to the pan). Add in the water and bring to a boil. Skim off any floating residue. Add in the rest of the soup soy sauce and minced garlic. On medium heat, simmer for about 20 to 30 more minutes. Sprinkle additional salt to taste. *If you’re pressed for time, 20 minutes is fine! The longer you simmer, the deeper the flavour will get. 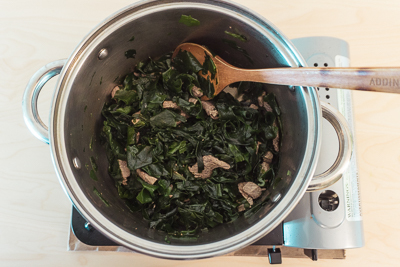 Pour a serving with some seaweed and beef pieces into a large soup bowl. 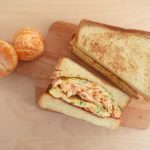 Serve with a warm bowl of rice and kimchi! Take a spoonful of rice and dip it into the bowl of soup!